Mega Oil™ is a nutrition for the skin. 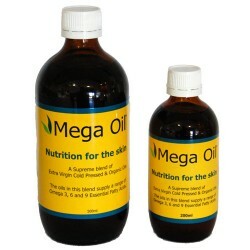 An internal oil (it is swallowed) supplement that is high in Omega 3, 6 and 9, Mega Oil™ is a supreme blend of Extra Virgin, Cold Pressed and Organic Oils. Mega Oil™ is aimed at treating the internal causes of skin disorders, and for general well-being, as it is an excellent source of essential fatty acids. Its delicious nutty flavour can also be added to your favourite food! Flaxseed Oil, Soybean Seed Oil, Evening Primrose Oil, Borage Oil (15ml GLA) Safflower Seed Oil, Sunflower Seed Oil, Sesame Seed Oil, Pumpkinseed Oil.